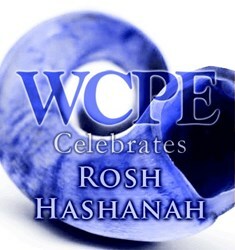 WCPE offers Special Programming for Rosh Hashanah. We will have performances by Itzhak Perlman, Chicago a capella and the Zamir Chorale of Boston. Wednesday evening, September 4, at 6 p.m. ET, WCPE presents a special program of music for Rosh Hashanah to celebrate the Judaic New Year as prescribed in the Biblical Book of Numbers. From the beginning of Rosh Hashanah through Yom Kippur - the Day of Atonement - the mood, music and liturgy call for a somber, penitential introspection, both individually and as a community. The program will be repeated Thursday, September 5 at 1 p.m.
“We will have performances by Itzhak Perlman, Chicago a capella and the Zamir Chorale of Boston,” offers Music Director William Woltz. With a 33 plus year history, WCPE 89.7 FM is a non-commercial, 100 percent listener-supported, independent station dedicated to excellence in Great Classical Music broadcasting. WCPE is heard worldwide on the Internet in multiple formats, including the next generation IPv6. Because WCPE receives no tax-derived support, the station conducts two on-air fundraising campaigns and two major mail-out campaigns per year to raise needed operating funds. For more information, visit http://theclassicalstation.org or call 919-556-5178.